On April 4, 1968, at 6:01 p.m., while he was standing on a balcony at a Memphis hotel, Martin Luther King Jr. was shot and fatally wounded. Only hours earlier King ended his final speech with the words, “I may not get there with you, but I want you to know tonight, that we as a people will get to the Promised Land.” Acclaimed public intellectual and best-selling author Michael Eric Dyson examines how King fought, and faced, his own death, and how America can draw on his legacy in the twenty-first century. 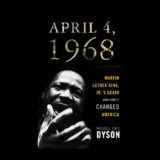 April 4, 1968 celebrates the leadership of Dr. King, and challenges America to renew its commitment to his vision.